In order to "convert" an acoustic guitar a couple of things must be changed. First, the nut must be replaced as the string slots will be too small to accommodate the bass strings and too large for the treble strings. Simply cutting the small slots wider for the bass strings will still leave the treble strings to vibrate freely in the large slots which no only looks bad, it usually results in buzzing. Because of the shape of most nuts, it is not possible to simply flip them around. The angle of the saddle slot on an acoustic guitar/bass determines string length and has a direct and profound effect on the instrument's intonation (it's ability to play in tune in all areas of the neck). 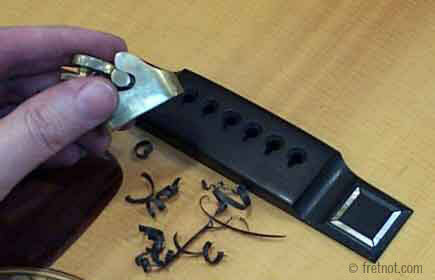 In order to correct the intonation and reverse the angle of the saddle the slot must be filled and pre-cut, or the bridge completely replaced. Pickguards, while they can be removed, often leave a very noticeable 'tan line', so many players opt to leave them and simply add another or go without. Saddle slot is filled prior to re-routing the correct position. Some will read that heading and think..."duh, like leave 6 strings off genius" and while you'd be correct there are other issues to consider. The first issue that dissuades most would be the width of a 12 string neck. If you like neck width akin to a classical guitar then I suppose that may not be a big deal. Another thing to remember is that a 12 string guitar is braced for 12 strings. Most of the time the reduction in tension due to the missing strings simply does not excite the top in a way to produce a good tone, albeit there is likely to be exceptions. A few 12 string guitar may have such stiff necks that they do not bow or relieve properly without the tension from all 12 strings. In those cases, after releasing all tension on the truss rod the neck still fails to pull itself straight or provide a suitable amount of relief. Professional conversions would require the top and the neck to be replaced, which will exceed the cost of many moderately priced guitars as this is being done by a luthier, not in a factory where equipment does 90% of the work. Keep in mind that the original top is braced heavier, has a much larger bridge, has a bridge plate with 12 holes in it. A neck built for a 6 string guitar will have a fingerboard that is not as wide as the original, which would leave obvious tell tale signs where the original glued to the top and where the heel meets the body. So, now one can understand why my reply is normally...go shopping for a 6 string guitar or ...leave 6 strings off.